Batman is angrily looking for Hush. Seeing as how more conventional sources have proven unreliable, he's shifted his focus to the inmates of Arkham Asylum. And while it's always a risky proposition to trust the word of a mental patient, let alone one who's imprisonment is a direct result of your own intervention, Bats has his ways of extracting the god's honest truth from the unlikeliest of subjects when he's motivated. Tonight? Yeah, he looks fairly inspired. Under writer Paul Dini's watch, the latest arc of Detective Comics has enjoyed a variety of twists, turns and glances in unexpected directions. His take on Hush, the caped crusader's latest big-name nemesis, is intelligent if a bit erratic, which stays in line with the rest of his storytelling. Dini will reel you in with a great setup, only to suddenly change directions in favor of something that, while unexpected, doesn't always make a lot of sense. 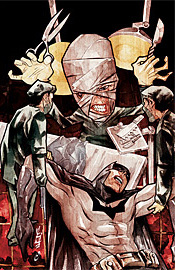 For example, last month Hush wounded Batman by perilously injuring Catwoman, actually removing her heart and keeping her alive with the aid of a complicated bit of machinery. I love the idea of getting into Bruce's head by striking those he's grown unexpectedly close to, but for me the whole heart removal thing throws the believability of the entire storyline into question. I think Dini had many of the same reservations, because the last half of this issue is spent abruptly explaining in detail how a machine like this would actually work. The problem is, the feasibility of actually doing this isn't what's been bothering me… it's the question of where Hush found the time, how he managed to sneak up on Selina and how she's going to immediately return to form afterwards. Dustin Nguyen's sharp-edged, simplistic artwork accompanies Dini's writing this month. His style, exaggerated and manga-inspired, has its roots set in the right place but isn't yet a complete package. His layouts and storytelling are strong, particularly when he's focusing on an action scene, but Dustin struggles to keep the reader's attention during slower, dialog-focused pages. While the two are stylistically about as similar as a grapefruit and a Honda, Nguyen often shows the influence of classic Batman artist Kelley Jones in the shadowy mood and horror-tinted grimness of many of this issue's characters and locales. In broad daylight, the denizens of Gotham are light, airy and handsome, but when the sun goes down and shadows creep into their faces, they each display a dark, chilling side that's usually kept hidden. Reading this issue is like browsing Da Vinci's sketchbook – some of the ideas Paul Dini presents are outstanding, but they're mixed up with dozens of other concepts that aren't nearly as compelling. His jolting changes of direction and strange decisions make this story difficult to follow, its characters' true motivations impossible to grasp. Flip through it to appreciate the impressive details of Hush's master plan, but don't think too much about the odd route he's taken to get there. Your brain might pop.